Seam bowler James Harris says "the dream is still there" to play for England. The 25-year-old would end a decade without a Welsh-born player in the England side if he was selected. Harris is Middlesex's leading County Championship wicket-taker in 2015 with 58 victims in the first 12 matches. "It would be great for me, great for everyone back at home and great for everyone here [Middlesex] to see me in England colours one day," he said. Harris has reached England limited-overs squads and frequently featured for the second-string England Lions side. His efforts this season include a spectacular career-best 9-34 against Durham. Simon Jones' England career ended during the Ashes triumph of 2005, while Geraint Jones, who was born in Papua New Guinea to Welsh parents, played his final Test in December 2006. Harris believes he now has a good chance of making one of the senior England sides. "Hopefully I'm climbing up the ladder the right way now instead of the last two years going the wrong way down it," Harris added. "I got close, but at the end of last season found myself a long way away so being talked about now in the company of bowlers that England have now is very pleasing. "I've still got a lot of work to do, I can still bowl a heck of a lot better than I'm bowling now, and that'll come, bowling more overs and getting my action bedded back into how I'd like it. "If I can build in a bit of extra pace from the gym and a few places over the next winter then hopefully I'll be bowling even better come this time next season. "We'll see what happens, but I'm really pleased with the form I've shown this year. The dream is still there to play for England." 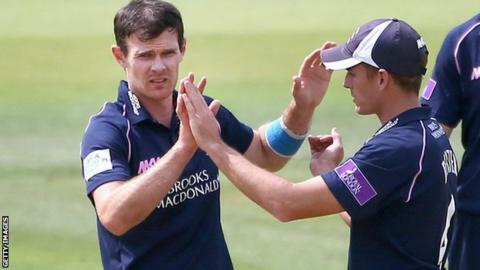 Swansea-born Harris moved to Middlesex in 2013 in search of first division cricket, but did not benefit from attempts to re-model his bowling action, and ended up back at Glamorgan for a spell in 2014. "I loved coming back, it was a shame I didn't come back with my best form for a couple of weeks, but managed to bowl okay and that started the process of gleaning some form and bowling well this year." "Obviously I'm still close to people back home, that part of the world will always be home to me and once we finish the season I'll spend a bit more time there."